You never know when being nice to your dining hall staff will pay off. It’s November. Midterms and papers and giant mountains of work await. You are locked in your dorm, or apartment, or Mugar stairwell, and you hear it. The grumblings of an empty stomach. All of your salty study-foods have been digested. You need sustenance! So you leave your study-cave, probably in sweats and flip-flops, and make your way to the nearest dining hall, because alas, you have used all of your Dining Points on Late Nite already (change your meal plan to the 250, stat). You may encounter a line of fellow study-zombies awaiting noms. Fear not! You will arrive post haste. We encourage you to have your ID ready when you make it to the desk, however, lest those behind you start a riot. Seriously, you’d be surprised. There are many things you can do to make your dining hall experience mostly enjoyable (we really can’t help you when the waffle batter runs out in the evening–we’re pretty depressed about it too). And I know it’s November, and you’ve been doing this since at least September (longer for all of you who aren’t freshmen), but sometimes you forget when the work piles up and you’re too busy to say thank you. We understand, but sometimes a friendly reminder or 5 makes all the difference. So I’m here today to take you on a friendly journey through your local dining establishment. 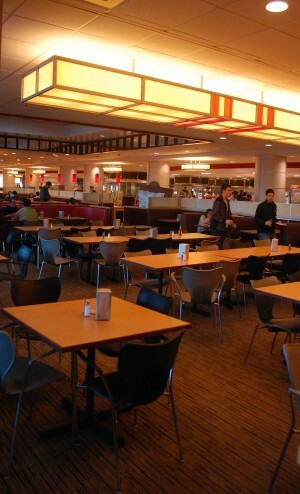 Depending on your dining hall, the swipers can be student workers or Aramark employed workers. If they are a student, it’s likely that they are an upperclassmen who has moved his or her way through the ranks into being able to sit and get paid for it. Rest assured though, it’s not an easy job, especially at the bigger dining halls. They’re very long shifts and sitting in the same place for six hours can get very boring and very, very cold in the winter. If there is a long line, Please have your ID ready and don’t fumble with your wallet trying to find it. It can hold up the line and take that much longer for everyone else. If you do forget, and we all do, to take it out early, step out of line briefly to find it. You can step back in where you left off when you find it. If you forget your BU ID entirely,we CAN punch in your number, but technically aren’t allowed to, just in case you’ve memorized someone else’s number (which is often illogical). You CAN pay cash, you just don’t want to, it isn’t cheap. The apartment plans DON’T have guest meals and you CAN’T use your normal meals as guest meals (unless you’re leaving your guest stranded by themselves in the dining hall). Meals reset Friday morning for the weekly plans, and you can only swipe one regular meal per dining period (lunch is the exception because it’s so long, and technically you can swipe twice in a row, but the swipers technically aren’t allowed to do it). You CAN use points for meals or guest meals and unlimited is really seriously unlimited (and you can swipe in guests on it, but again, the swipers technically aren’t allowed to). Please be nice to your swiper. We are people too. And we can get pretty grumpy because we’ve been sitting in the same place for several hours and want to be able to move, but we really can’t. Don’t come up on your cell phone because we will hear your half of the conversation and it comes off rather rude. Don’t try to sneak by us, we see you. And will remember you next time you try to schmooze us for a free guest meal. I can’t stress this enough. Get your table BEFORE you get your food. There is nothing worse than standing around with a plate of something you want to stuff your face with and having nowhere to sit. Also, It’s okay to make multiple trips, we really don’t judge you, there are no trays. And If you drop something, the dining hall staff is…mostly unhappy about it. Also. don’t leave your cellphone or something expensive as your seat holder, it probably won’t get taken, but it does happen. And dishes are NOT adequate placeholders for you. Plenty of people leave the dining hall without cleaning up after themselves. We don’t know if that’s you. This goes without saying, but if there is a line. Please don’t cut it. If we’re serving you, we don’t want to deal with the angry people you’ve cut after you. Everyone is hungry, they just got there first. Again, you can make many trips, assuming you have a table. If your old plate is clean enough, awesome, bring it back. If not, We have plates. we promise. You can use more than one. If you don’t want something, please speak up about it. We will not put it on your plate. But if you say “everything” but only mean “the chicken,” your chicken may be covered in the carrots you did not want, and children in third world countries will cry. Also, as a warning. sometimes the plates are really, REALLY hot. This is because they’ve just been washed, and we’re secretly burning your fingerprints off so you can be part of the Men in Black and shoot aliens. If you don’t want to deal with aliens and/or like your hands intact, please be careful. CLEAN UP AFTER YOURSELF! There are places to put your dishes, use them. Every time you leave your things behind, a dining hall employee casts a pox upon your house. You are presumably adults and presumably have working limbs, PLEASE be a respectable human being and take your dishes to the nearest conveyor belt. If you don’t do it. We have to. And no one likes cleaning up after spilled coffee and pasta sauce explosions, especially when we didn’t cause them. Also, don’t walk out of the dining hall backwards, the number of people collisions, while amusing, are getting out of hand. Sometimes our food selection is awful. We can’t help that. You can take things from the dining hall. Illegally, just don’t get caught and don’t be angry if someone chases you down and takes your second apple. We don’t like doing it, but it is our job. Give them the apple and do a better job next time. If you know the native language of some of the Aramark workers who have trouble with English, have a conversation with them. Not only are they great people, they will remember you and make a point to do so. Be Polite to the staff. Food Service isn’t glamorous, but it isn’t easy. Some of us are students and use our money to buy liquor, but some of us are supporting our families. We are real people who like real human interaction. Sometimes we mess up. Sometimes we’re cranky. Sometimes you mess up. Sometimes you’re cranky. It happens. We will do what we can to fix what’s wrong. We may not remember you, remember, we see a LOT of people on a daily basis. So there you have it. What to do, what not to do and everything in between. We wish you well on your exams and the satiation of your hunger. Anything you want to know? Ask in the comments. Previous Article Giants Win! But Do We Care?